Please note that the content of this book primarily consists of articles available from Wikipedia or other free sources online. 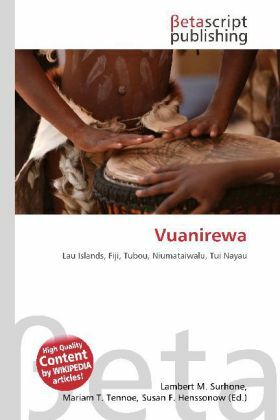 The Vuanirewa is the ruling tribe (yavusa) of the Lau Islands, a scattered group of more than a hundred islands (16 inhabited) and reefs along the eastern edge of Fiji. The members of this clan all hail from the village of Tubou on the island of Lakeba and claim descent from one of four noble households (mataqali) that make up the tribe. These four noble households are Matailakeba, Vatuwaqa, Koroicumu and Naivi and all claim descent from the first High Chief (Sau) of the dynasty, Niumataiwalu.